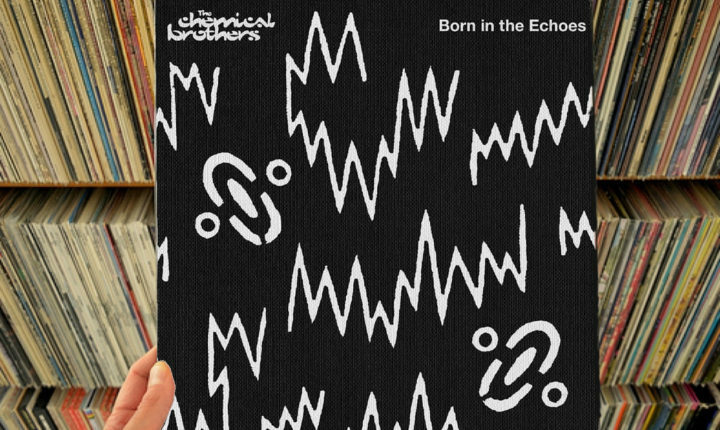 A deeper look at the grooves pressed into the vinyl reissue of Born In The Echoes by The Chemical Brothers. After over a quarter century of holding dance clubs hostage with some of the most well-known club-pop ever to also grace radio airwaves, the question has become how The Chemical Brothers have held the the venerable position they have. They are some of the most visible purveyors of dance club music and culture after all and, in a form which has historically the next “new big thing” above all else, that the duo has managed to maintain their audience is quite a feat. Listening to the group’s eighth studio album, Born In The Echoes, the answer is pretty clear: utilizing an established template/framework (which has been set in place for the last twenty-five years), The Chemical Brothers then scan the popular taste of the moment and discretely pick out different elements that they like/appreciate and then decorate the frame with their impressions of those bits. It might sound like a crass or calculated method of operation but, if one really listens carefully, it is really easy to spot in every album the group has ever released – Born In The Echoes included. Love or hate that summation of how The Chemical Brothers function, it’s awfully difficult to argue it. Keeping the procedural methodology outlined above in mind, it’s very easy to hear the Chemical Brothers’ design unfold quickly as “Sometimes I Feel So Deserted” builds and begins to spread out to open Born In The Echoes. There, listeners won’t be able to stop their anticipation from getting their pulses to race as the bass and beat fade in like a tide of grand inevitability. There aren’t many timely touches hanging on the frame yet, but they’re coming. Then, at about the minute-and-a-half mark Daniel Pearce chimes in with the words “Sometimes you can feel so deserted, but hold on ’cause help is on the way,” the beat rolls over and those listening are launched headlong into the album; assaults from a slapped bass threaten to rewrite listeners’ bodily rhythms and, as that happens, those same listeners will find their bodies beginning to move involuntarily with the music. That’s when they’ll know the hook is set and there won’t be any going back. After “Sometimes I Feel So Deserted” basically pushes listeners through the album’s front door, “Go” picks them up earnestly with an opening sample from what sounds like Rush’s “Tom Sawyer” and holds them tightly with all the power that the group’s pedigree affords them before spinning the around until they just don’t want to escape. It’s then that some listeners (and critics) may notice and scoff at just how classically poppy the sound of this album is proving to be (the bridge of “Go” sounds like it might have been lifted right out of “Conga” by the Miami Sound Machine – yeah, yeah, yeah, debate the sample choices on your own time, reader) and how surprisingly satisfying that is proving to be. The same kind of poppy pastiche is the glue which binds the side-closer “Under Neon Lights”and will miraculously have listeners swimming delightedly through the song before the album’s B-side gives up “I’ll See You There” and the C-side drops “Reflexion” and the two-track dynamo which is the D-side comes out to clean up and give listeners a hearty chill-out. At that point, listeners will realize that, yes, they just swung and wiggled their way through a very poppy and candy-coated affair but, as they wipe the sweat from their collective brough (it won’t matter if they were actually dancing or not – the sound is so infectious that it may be sympathetic sweat), they won’t be able to deny that the experience through Born In The Echoes was tight and solid. It might not have been what they had hoped for initially, but it got them where they needed to be. The vinyl reissue of Born In The Echoes is out now. Buy it here on Amazon.